Description Of Item: Cars Character Cars With Lenticular Eyes. 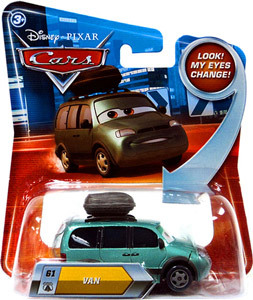 The fun of the animated sensation continues with the Cars Character Cars Assortment featuring character vehicles with changing lenticular eyes that really bring the characters to life! These 1:55 scale die-cast cars are big on personality and detail. The friendly folks in Radiator Springs eagerly await their next road adventure with you!